To oversee the Parish finances and make recommendations to Parish Council and to prepare the annual budget for presentation to Parish Council and the community. Commitment: One meeting per month. To work with the pastor to ensure the parish is working effectively. Commitment: 2 hours once per month in the evening. Participate on various council sub-committees. To provide calligraphy on special certificates. To provide banners or decoration for special occasions. 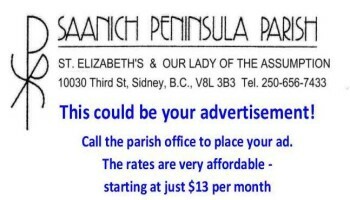 To take photographs at significant parish functions. Commitment: As dictated by the event. To beautify the worship space in our churches. Commitment: Weekly and on-demand for special occasions. To maintain the lawns and the flower gardens around the churches. To provide professional skills or consultation in various areas of maintenance and repairs. Such as a carpenter, electrician, plumber. To measure and mark plots. Arrange clean-up work parties and general maintenance of cemetery. Commitment: As needed (approximately 2 hours, monthly). To ensure that the audio and visual electronic systems are maintained and operating effectively.